The Prime Aire engine-driven model PA6D60-4045T FT4-ESP is a 6” x 6” (152 mm x 152 mm) priming-assisted, environmental Silent Pump with autostart that provides flow up to 2,320 GPM (146.2 lps) and heads to 158 Ft. (48 m). This model is available in cast iron construction and is designed to pass solids up to 3” (76.2 mm) in diameter. It is powered by a Final Tier 4, liquid-cooled John Deere engine. 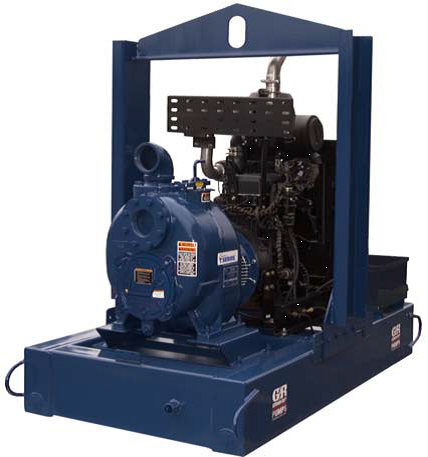 The Super T Series engine-driven model T4A60S-4LE2T FT4 is a 4” x 4” (102 mm x 102 mm) self-priming pump with Auto-Start that provides 830 GPM (52.3 lps) and heads to 150 Ft. (45.7 m). This model is available in cast iron construction and is designed to pass solids up to 3.0” (76.2 mm) in diameter. It is powered by a Final Tier 4, liquid-cooled Isuzu engine. The 10 Series engine-driven model 14D52-1B50 FT4 S/G is a 4” x 4” (102 mm x 102 mm) self-priming pump that provides 500 GPM (31.5 lps) and heads to 74 Ft. (22.5 m). This model is available in cast iron construction and is designed to pass solids up to 2.0” (50.8 mm) in diameter. It is powered by a Final Tier 4, air-cooled Hatz Diesel engine.